There are all kinds of birds in this world, singing all kinds of songs. But neither you nor they have probably heard anything like this! Speaker included. The Digital Bird uses four digital NAND gates to produce the birdy sounds. 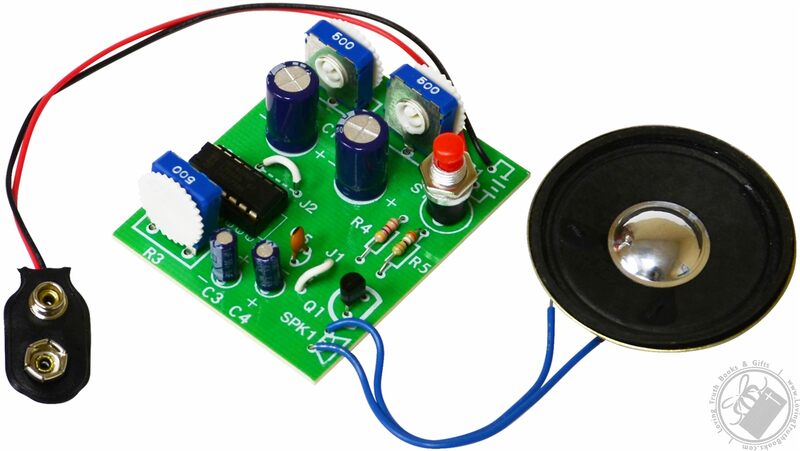 It consists of four individual circuits: two oscillators, an audio amplifier and an R/C. The first oscillator produces a square wave signal whose frequency can be varied by adjusting a variable resistor. The output of the first oscillator is modified by passing it through a high pass R/C network. The resulting sound is fed to an audio amplifier which drives a speaker. What makes the Digital Bird so exciting is the fact that three circuits have variable controls. Thus, the sound output can be adjusted over a wide range to give an unusually large variety of audio sounds in the “birdy frequency” spectrum.